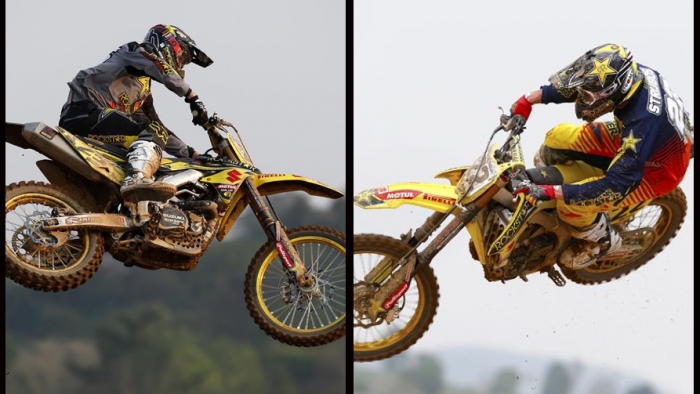 Suzuki roared back into contention for top spoils in the FIM Motocross World Championship as Clement Desalle took his Rockstar Energy-backed factory RM-Z450 to second position overall at a sweltering Si Racha for the Grand Prix of Thailand and the second round of 18 in the 2014 campaign. More than 22,000 spectators suffered the same sunshine as the paddock but it was on the track where the temperatures had the most impact: One week after the nocturnal desert setting of Losail in Qatar opened the calendar, the teams and riders of the MXGP and MX2 classes were submerged in the heat and humidity of Si Racha, 100km from Bangkok and close to the tourist city of Pattaya. Fast, loose and very dry, the ground was also slippery in places and lap-times were close, placing even more importance on the starts of the motos. Desalle rode to a confident second position on Saturday and intimated his level of enjoyment on the RM-Z450 and around the Thai course meant a high level of competitiveness for race day. This was evident in the first moto of 30 minutes and two laps when the Belgian played second-fiddle to Tony Cairoli and was a comfortable distance ahead of Jeremy Van Horebeek. With the runner-up spot and 22 points, Desalle was primed for the second moto and sniffing the overall win. He sprung out of the gate and passed Van Horebeek quickly in a slightly cooler second outing towards the end of the afternoon. Soon Cairoli was in pursuit but Desalle looked in control until his machine started to develop some power issues and he had to back-off and exercise caution in attempting some of the jumps. One possible cause of the problem might have been the special grade of racing fuel (approved and necessary for this Thai event) and its reaction to the excessive heat. Team-mate Kevin Strijbos also suffered the same as did two other teams, brands and factory motorcycles. Desalle cut a frustrated figure on the podium after the Grand Prix after leading 12 of 18 laps but soon came to look on his first top-three of 2014 as a step in the right direction for the championship; he is now fifth in the standings and 21 points away from first place. Strijbos also had his wings clipped by the mysterious power condition. The Belgian had recovered from a mediocre start in the first moto to reach a season-best seventh position but his possibilities were curbed in the second race where he concentrated on reaching the finishing line in one piece and collected seven points; standing 11 overall. After back-to-back Grands Prix, the Rockstar Energy Suzuki World MXGP crew will now re-pack the bikes and equipment and head back to base in Lommel, Belgium. A two-week break precedes another flyaway trip with the busy and popular site of Beto Carrero hosting the first of two trips to Brazil on the 2014 schedule. MXGP Moto1: 1. Antonio Cairoli (ITA, KTM), 34:26.300; 2. Clement Desalle (BEL, Rockstar Energy Suzuki), +0:14.798; 3. Jeremy Van Horebeek (BEL, Yamaha), +0:31.856; 4. Gautier Paulin (FRA, Kawasaki), +0:37.008; 5. Kevin Strijbos (BEL, Rockstar Energy Suzuki), +0:44.884; 6. Maximilian Nagl (GER, Honda), +0:50.347; 7. Shaun Simpson (GBR, KTM), +0:56.111; 8. Davide Guarneri (ITA, TM), +1:09.408; 9. Xavier Boog (FRA, Honda), +1:10.985; 10. Todd Waters (AUS, Husqvarna), +1:13.856; 11. Evgeny Bobryshev (RUS, Honda), +1:30.022; 12. Steven Frossard (FRA, Kawasaki), +1:36.228; 13. Tanel Leok (EST, TM), +1:41.030; 14. Joel Roelants (BEL, Honda), +1:45.334; 15. Rui Goncalves (POR, Yamaha), +2:24.989; 16. Pascal Rauchenecker (AUT, Husqvarna), -1 lap(s); 17. Augusts Justs (LAT, Husqvarna), -1 lap(s); 18. Klemen Gercar (SLO, Honda), -1 lap(s); 19. Jens Getteman (BEL, Honda), -2 lap(s); 20. Arnon Theplib (THA, Honda), -2 lap(s). MXGP Moto2: 1. Antonio Cairoli (ITA, KTM), 35:05.060; 2. Clement Desalle (BEL, Rockstar Energy Suzuki), +0:13.336; 3. Jeremy Van Horebeek (BEL, Yamaha), +0:30.809; 4. Maximilian Nagl (GER, Honda), +0:47.127; 5. Evgeny Bobryshev (RUS, Honda), +1:00.667; 6. Todd Waters (AUS, Husqvarna), +1:01.753; 7. Rui Goncalves (POR, Yamaha), +1:03.518; 8. Davide Guarneri (ITA, TM), +1:07.127; 9. Gautier Paulin (FRA, Kawasaki), +1:11.149; 10. Xavier Boog (FRA, Honda), +1:22.690; 11. Shaun Simpson (GBR, KTM), +1:28.405; 12. Joel Roelants (BEL, Honda), +1:42.364; 13. Matiss Karro (LAT, KTM), +1:53.370; 14. Kevin Strijbos (BEL, Rockstar Energy Suzuki), +2:16.381; 15. Jake Nicholls (GBR, KTM), -1 lap(s); 16. Pascal Rauchenecker (AUT, Husqvarna), -1 lap(s); 17. Augusts Justs (LAT, Husqvarna), -1 lap(s); 18. Tanel Leok (EST, TM), -1 lap(s); 19. Klemen Gercar (SLO, Honda), -1 lap(s); 20. Arnon Theplib (THA, Honda), -2 lap(s). MXGP Overall result: 1. Antonio Cairoli (ITA, KTM), 50 points; 2. Clement Desalle (BEL, Rockstar Energy Suzuki), 44 p.; 3. Jeremy Van Horebeek (BEL, YAM), 40 p.; 4. Maximilian Nagl (GER, HON), 33 p.; 5. Gautier Paulin (FRA, KAW), 30 p.; 6. Evgeny Bobryshev (RUS, HON), 26 p.; 7. Todd Waters (AUS, HUS), 26 p.; 8. Davide Guarneri (ITA, TM), 26 p.; 9. Shaun Simpson (GBR, KTM), 24 p.; 10. Xavier Boog (FRA, HON), 23 p.; 11. Kevin Strijbos (BEL, Rockstar Energy Suzuki), 23 p.; 12. Rui Goncalves (POR, YAM), 20 p.; 13. Joel Roelants (BEL, HON), 16 p.; 14. Tanel Leok (EST, TM), 11 p.; 15. Pascal Rauchenecker (AUT, HUS), 10 p.; 16. Steven Frossard (FRA, KAW), 9 p.; 17. Matiss Karro (LAT, KTM), 8 p.; 18. Augusts Justs (LAT, HUS), 8 p.; 19. Jake Nicholls (GBR, KTM), 6 p.; 20. Klemen Gercar (SLO, HON), 5 p.
MXGP World Championship Standings (after 2 of 18 rounds): 1. Antonio Cairoli (ITA, KTM), 92 points; 2. Maximilian Nagl (GER, HON), 76 p.; 3. Gautier Paulin (FRA, KAW), 75 p.; 4. Jeremy Van Horebeek (BEL, YAM), 72 p.; 5. Clement Desalle (BEL, Rockstar Energy Suzuki), 71 p.; 6. Evgeny Bobryshev (RUS, HON), 51 p.; 7. Kevin Strijbos (BEL, Rockstar Energy Suzuki), 50 p.; 8. Steven Frossard (FRA, KAW), 49 p.; 9. Todd Waters (AUS, HUS), 43 p.; 10. Joel Roelants (BEL, HON), 38 p.; 11. Davide Guarneri (ITA, TM), 35 p.; 12. Shaun Simpson (GBR, KTM), 34 p.; 13. Xavier Boog (FRA, HON), 31 p.; 14. Tommy Searle (GBR, KAW), 29 p.; 15. Rui Goncalves (POR, YAM), 28 p.; 16. Tanel Leok (EST, TM), 24 p.; 17. David Philippaerts (ITA, YAM), 17 p.; 18. Jake Nicholls (GBR, KTM), 16 p.; 19. Matiss Karro (LAT, KTM), 14 p.; 20. Pascal Rauchenecker (AUT, HUS), 10 p.